No staycation in Singapore (in fact any vacation!) is complete without an awesome breakfast at the hotel you are staying in. 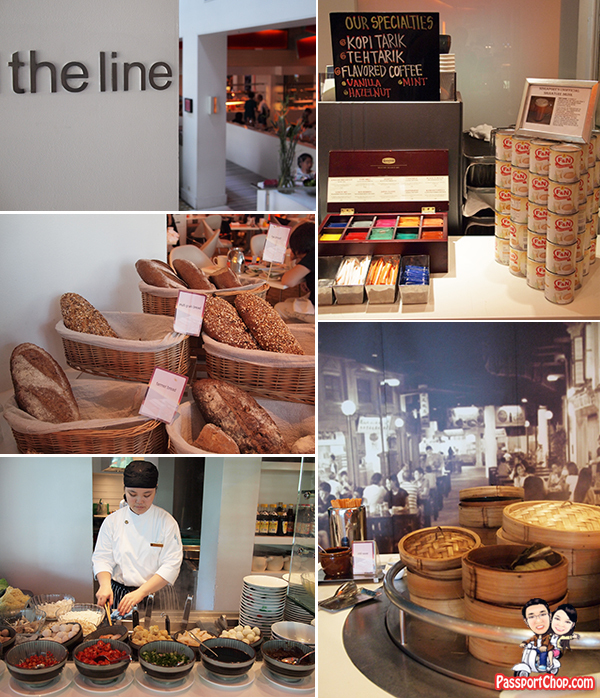 During PassportChop’s staycation at Shangri-La Hotel Singapore, we had the opportunity to check out not 1 but 2 of their signature breakfasts at the Waterfall Cafe and the Line! Breakfast at Waterfall Cafe is itself a visual treat as the cafe’s interior design is a mix of colonial old-English charm (with its overhead fans and table lamps) and laid-back modern feel (with the open kitchen concept and scribbled menu boards). Waterfall Cafe prides itself on serving healthy yet creative dishes inspired by Mediterranean flavours. Everything sounds and tastes so healthy here – we ordered Buckwheat waffles with caramelized banana & vanilla, Gula Melaka & fresh cream and Buttermilk pancakes with blueberry compote, maple syrup & butter to start our healthy breakfast at Waterfall Cafe. The dishes tasted great and flavorful especially the caramelized banana that came with the waffles; the waffles ain’t like any waffle you will find selling in bakeries and 7-eleven i.e. you are not getting those flour-filled thick waffles which fill you up easily. In fact, these starters opened up our appetite for something slightly heavier (I know this sort of defeats the purpose of a healthy breakfast at Waterfall Cafe but the dishes sounds so irresistible!) – 2 Eggs Any Style (you decide! we chose scrambled) with Bacon, Pork Sausage, Mushrooms & Tomatoes and Eggs in Cocotte (with Roast chicken, zucchini, parmesan and rosemary) served with toast. The latter is the eggs in the small red bowl in the picture below. The classic French name for this type of egg dish is oeufs en cocotte and it is quite a healthy dish – no oil involved just oven baked. The bacon and sausages prepared were very well-cooked and not oily at all. 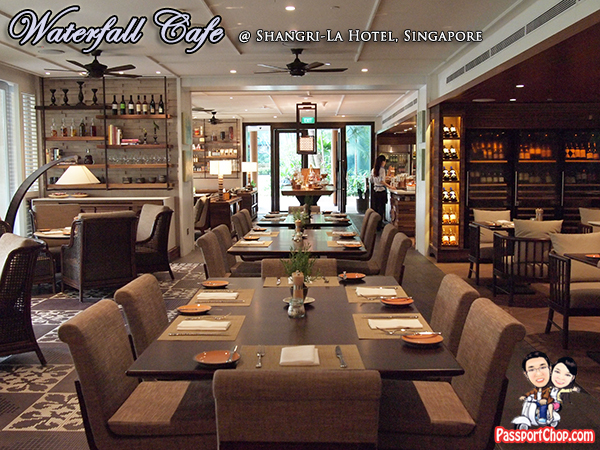 If breakfast is included with your room at Shangri-La Hotel Singapore, you can order as many dishes as you like from the menu at Waterfall Cafe during breakfast, like an ala carte buffet i.e. 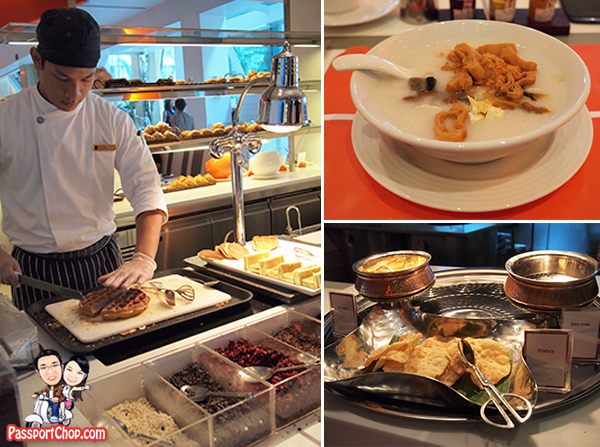 instead of filling your plate with food from a buffet line – the dishes you ordered are freshly prepared and cooked (and you can also see the chef preparing your breakfast due to the open concept kitchen). This also means some waiting time for your breakfast too – so start early before the morning breakfast crowds. Meanwhile, you can check out the Waterfall Cafe’s beautiful interior. Breakfast at the Waterfall Cafe is served from 6.30am to 11am daily. 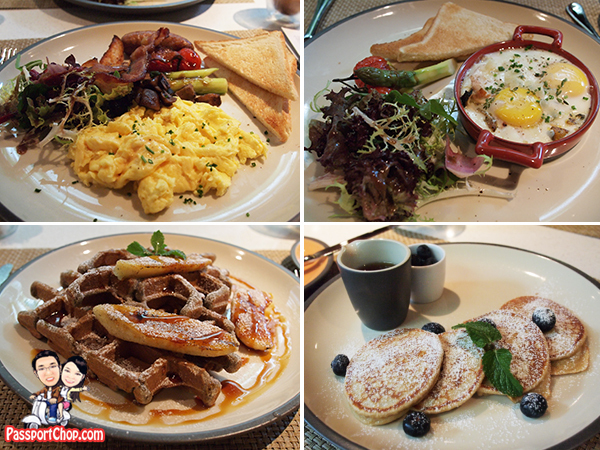 If you are dining ala carte at Waterfall Cafe, the above-mentioned dishes cost SGD $16++ each (except for the pancakes and waffles which cost SGD $12++ each). While exploring Waterfall Cafe’s beautiful interiors, we can’t help but notice Waterfall Cafe’s great selection of chocolate pralines, cookies, macaroons and meringue. While you may have a free flow of breakfast dishes from Waterfall Cafe’s menu, do note that these lovely little things i.e. 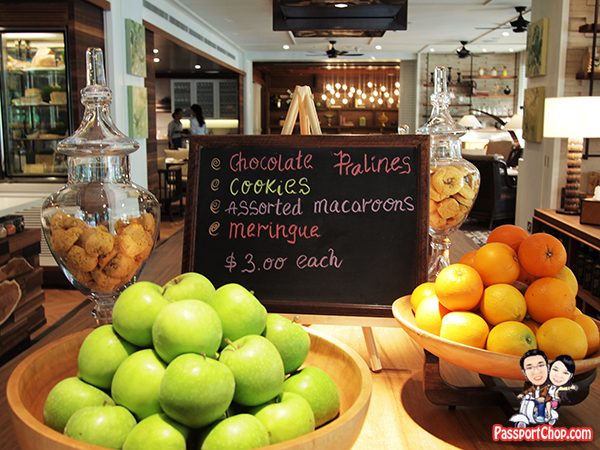 the cookies and macaroons are chargeable separately at SGD $3 per piece! Just a few steps away from Waterfall Cafe lies the famous The Line restaurant – even for breakfast, The Line boasts a spread of Indian, Chinese, English, Japanese and even Singaporean cuisines. Just to manage expectations, you won’t get lobsters, crabs (popular dishes of The Line buffet dinner from the Crustacean counter) during breakfast but there is still a great selection of dim sum and sushi available from the Sushi & Sashimi counter and Dim Sum Kitchen. Other counters/stations that are opened include the Noodle Shop, Tandoori Ovens and Bar as well as the lavish dessert selection which includes the 1-metre tall chocolate fountain. The Line is designed with a slick modern theme with predominantly bright colors like orange and white. as part of the decor, large plasma TV screens will simultaneously screen four custom-made art films about the origin of food. Named “Fish”, “Grain”, “Vegetables” and “Wine”, each film captures the essence of its namesake, characterised by a surreal style and uber-sleek presentation. If you crave for some simple kopitiam breakfast fare e.g. kopi-o and teh tarik – you can get it here at The Line! Mix it up with some siew mai and har kow at the Dim Sum station and some prawn noodle at the live cooking station – you are as close as you can be to some good old kopitiam breakfast at a much more comfortable setting at The Line. You can also savour some made-on-the-spot waffles with ice-cream as well as some North Indian cuisines with papadum, naan with your favorite curry. Well if you had a healthy breakfast at Waterfall Cafe yesterday, it’s time to indulge today at The Line with their sumptuous buffet spread. 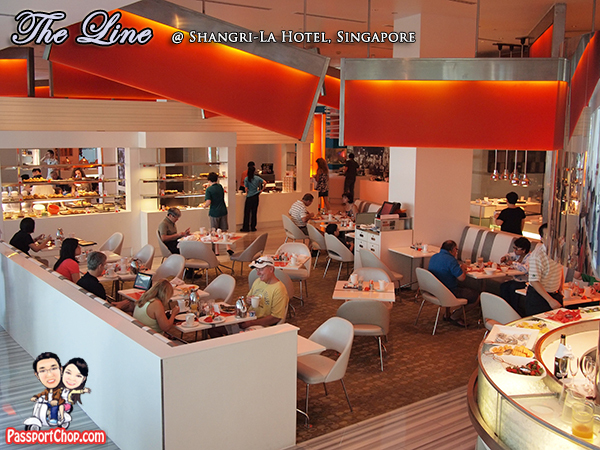 Do note that The Line can get really really crowded during breakfast so start early to avoid the crowds! Thank you for this post, It was a fantastic read which was extremely helpful.